My latest baby-related project is this Vespa/scooter mobile. (Because if this little dude is going to be anything like his dad, he'll probably spend his nights dreaming of scooters.) 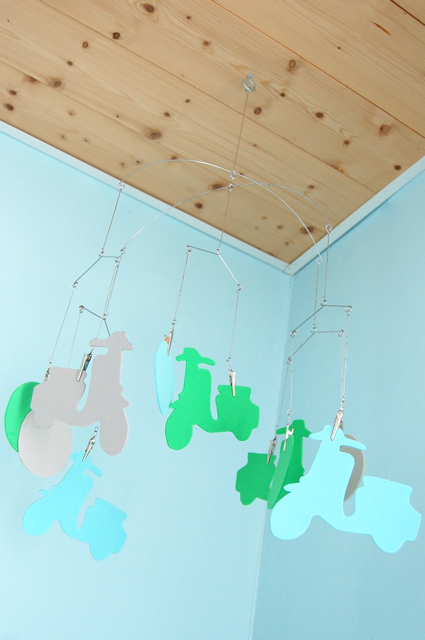 It was a simple project to make, for a child's room or any room in your house, and you only need a few supplies. Start with three to four sheets of coordinating craft foam. (Craft foam, you say?) Yeah. It sounds weird, but when you neatly cut craft foam into shapes and then hang them from the ceiling, they totally look like they're made from plastic or wood or something entirely different. Another bonus to craft foam (besides the fact that it's so inexpensive) is that it is really light-weight, so the mobile will turn and spin easily if there's a bit of airflow in your room. Along with the craft foam, you'll need to come up with a simple shape or two and make a template. 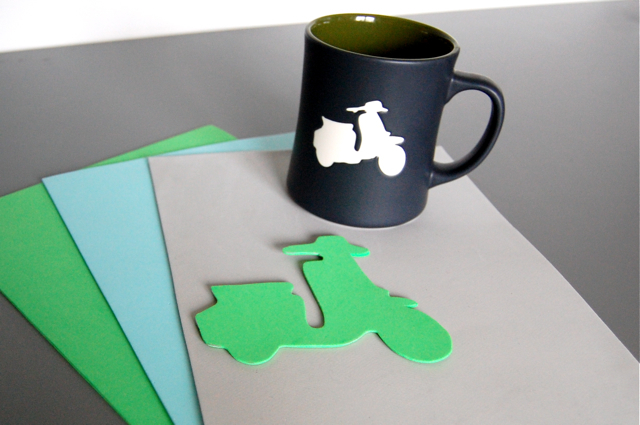 I free-handed this template onto cardstock and cut it out, using the Lambretta on this mug from Starbucks as a guide. But you can also raid children's coloring books or look online for simple clip art/silhouettes that you can trace to make your template. Each shape should be about 3 to 4 inches wide, and different sized shapes (some small, some larger) will work well together. 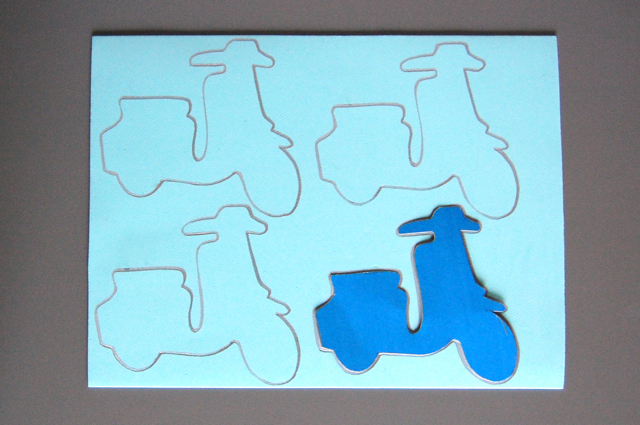 Then, use your cardstock template to trace the images onto the craft foam, and cut them out using a sharp scissors. 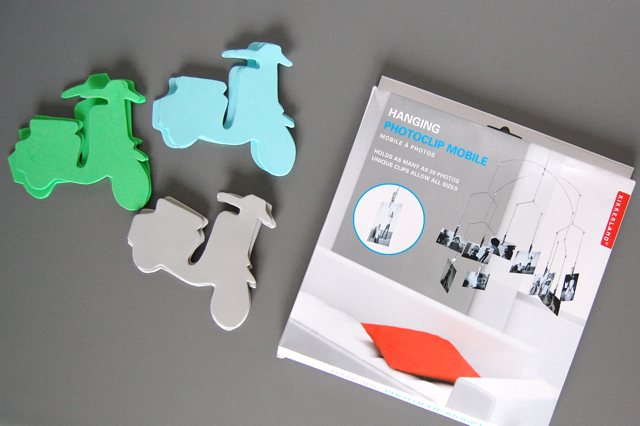 Take your little fleet of Vespas (or what-have-you) and clip them to your mobile and that's pretty much it! 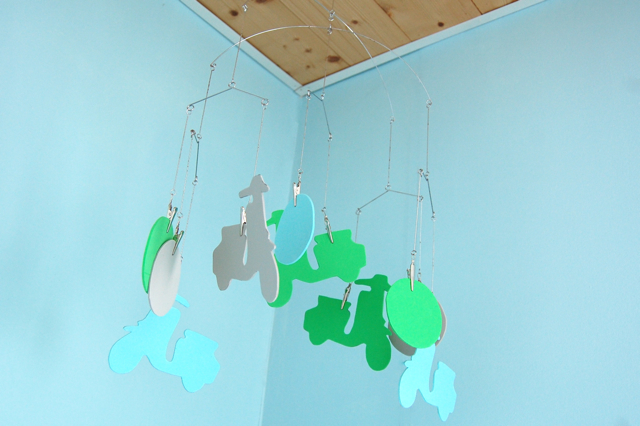 The mobile I used here is a Kikkerland hanging photoclip mobile, but you can find similar clip mobiles anywhere and they're really inexpensive. (Plus, you can change it up any time you want.) Add the $10 mobile plus three or four sheets of craft foam and you've got a pretty spiffy little customized mobile for less than $15. What a great idea! And seriously, you freehanded that? I initially thought you cut them with a die-cut! You rule. Also: LOVE the ceiling in the room. that is a rad mobile. I expect no less from you my friend. Best thing I've seen today. Very cool!